Reliance has been making a tremendous amount of news ever since it started rolling out JIO slowly in the past few months. 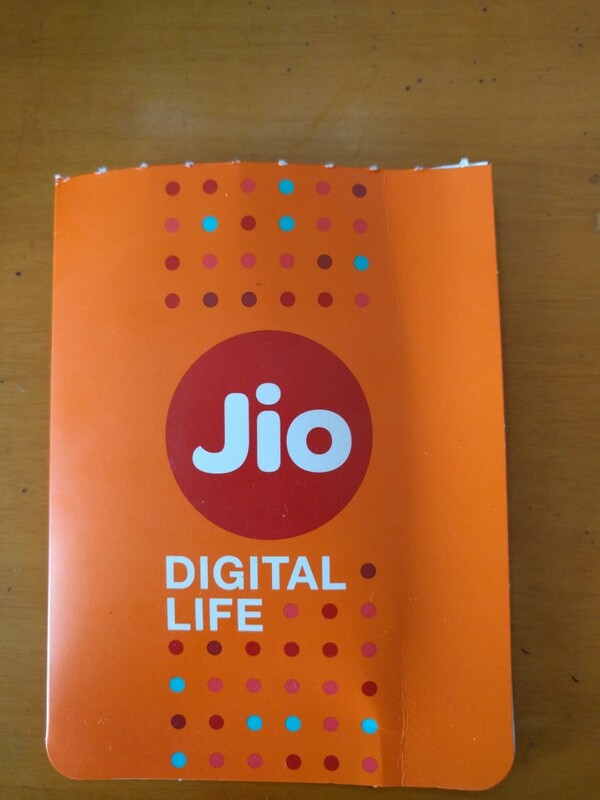 It all began with giving out the employee SIM and then things progressed into Reliance offering a unique new scheme. Free JIO 4G SIM with the purchase of any Reliance LYF Smartphone+ phone. With this offer and fantastic branding, Reliance LYF Smartphone+ has become a familiar name in the budget smartphones market. Now, LYF Smartphone+ has launched a new phone, the Reliance LYF Wind 3 Smartphone. It is another budget offering from the company which can compete very well with the current offerings from the other brands. In this article, we will go through the features and specifications of Reliance LYF Wind 3 Smartphone along with in-depth analysis of the offers that you get when you buy the phone. It has a 5.5 inch Full HD screen having resolution 1280 x 720 pixels. The display is also coupled with an Asahi Glass for protection. It is a dual SIM mobile supporting LTE + GSM SIM cards. It has a 2 GB RAM which is very competitive in the market. It has a 16 GB internal memory which is expandable up to 32 GB using a microSD card. It weighs 159.2 gram which does seem quite heavy. It has an 8 megapixels rear camera and a 2 megapixels front facing camera. The front camera can record full HD videos whereas the front camera can record up to 720p videos. It runs on Android v5.1.1 (Lollipop) currently which can be upgraded to Marshmallow soon. It runs on a Qualcomm 1.2 GHz Quad Core processor. It has a 2920 mAh battery which is very impressive considering its price and the fact that it will be used very much for 4G usage. The price of LYF Wind 3 Smartphone is Rs. 6999. The price of the phone is very good considering the features it is offering. I would say that a better processor could have powered the phone but I am quite impressed with the battery, and you can be assured that even with the 4G usage, this phone will give you a good battery life. 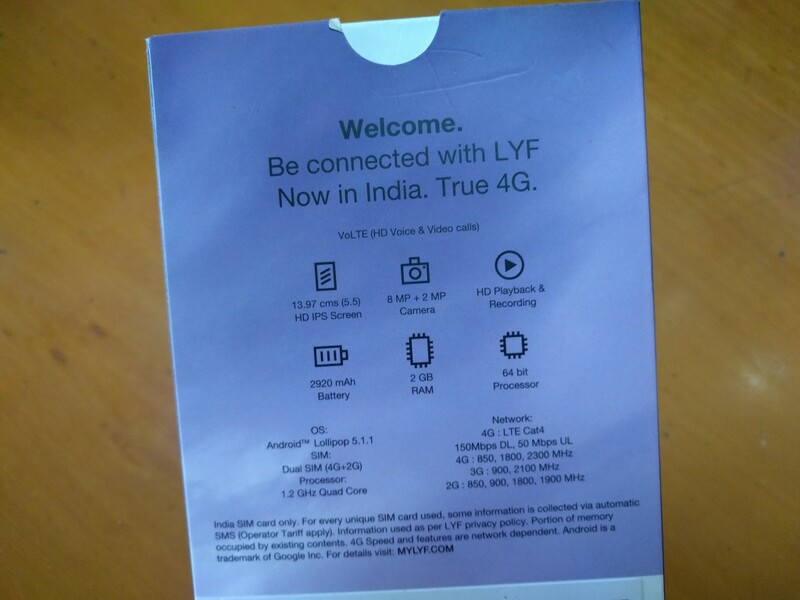 LYF Wind 3 Smartphone also comes with the JIO Preview Offer, so you get Jio 4G sim with the purchase of any LYF Smartphone+. JioPlay: You can use JioPlay to watch live television having the amazing amount of features. We have explained later in the article. JioOnDemand: Watch a huge amount of movies, trailers and video content on this app. JioXpressNews: It is a news and magazine aggregation app that combines information from 100s of sources. JioDrive: A secure online storage to store your photos and personal data. JioJoin: This is a very important app as you will be able to make HD voice and video calls from this app. JioSecurity: A security app for the safety of your mobile phone which you can use to store your contacts, email, bank information, and passwords. Jio Chat: A messaging app you can use for texts, voice calls, video calls, conferencing and messaging. JioMoney: A simple wallet for everyday transactions online. JioBeats: Listen to a vast variety of music, radio easily. JioMags: Browse and read an enormous collection of magazines across various categories. All the apps have been very useful for all the users. In this article, I would also like to point out three specific apps which have been critically acclaimed till now with fantastic ratings on the App Stores. 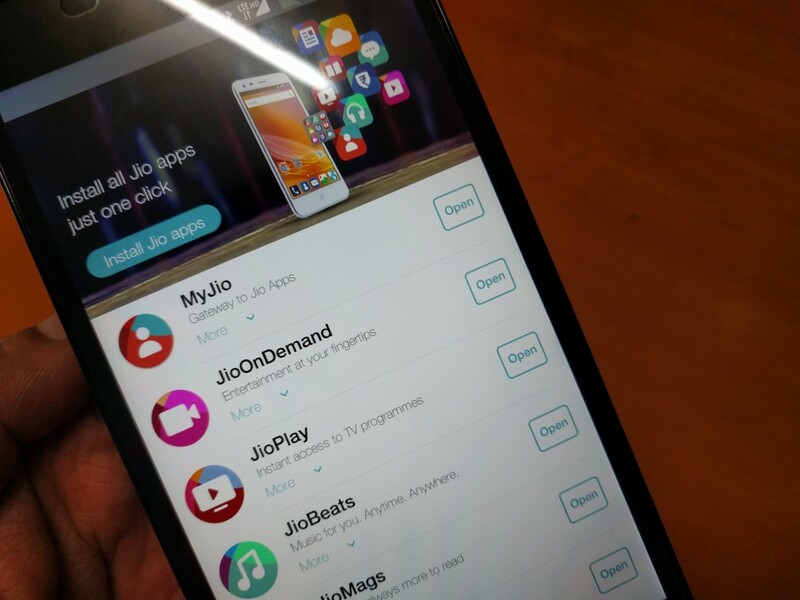 Jio Play: Jio Play provides instant access to TV Programmes. The app gives you more than 300 channels which include more than 30 High Definition channels. Other than this, the app allows you to pause Live TV. This enables you never to miss a moment of any TV Show you’re watching. Apart from this, the app also provides you with Catch-up service. You can watch and enjoy episodes from last seven days of prime time shows easily. Given that fact that you will be using 4G unlimited on your phone for the first 90 days, JioPlay will be of amazing use. Apart from all this, you can also explore the app in multiple languages, use the app with zero disturbances, and use the Mini Player to browse the content while the player is in mini view. 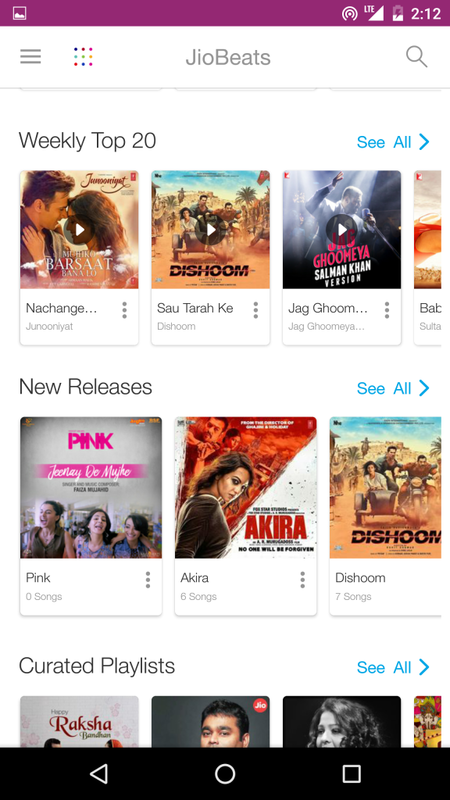 Jio On Demand: Whereas Jio Play gives you access to an incredible amount of television, Jio On Demand gives you the access to a humongous collection of movies, music videos and trailers across multiple languages and genres. You should know that when I mean humongous, I mean over 1 Lakh hours of High Definition content. The app provides you with an amazing amount of content that range from the latest releases to classics. A large amount of genres provided by the app is one of the many highlights which also include features like My Watchlist, One Tap Play, and Hyperlinked Starcast. 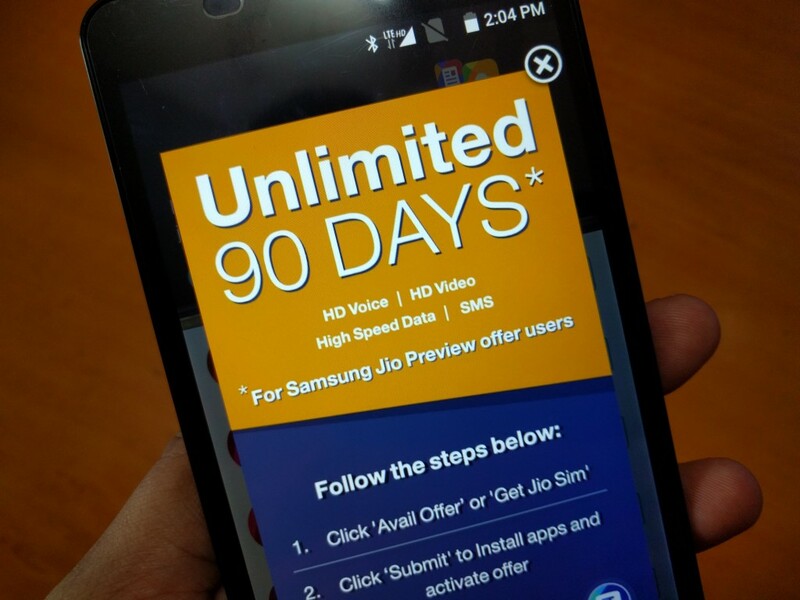 JioOnDemand is another fantastic app by the Jio team which let you use your 4G unlimited data to full swing and make you realize the power and benefits of the data. 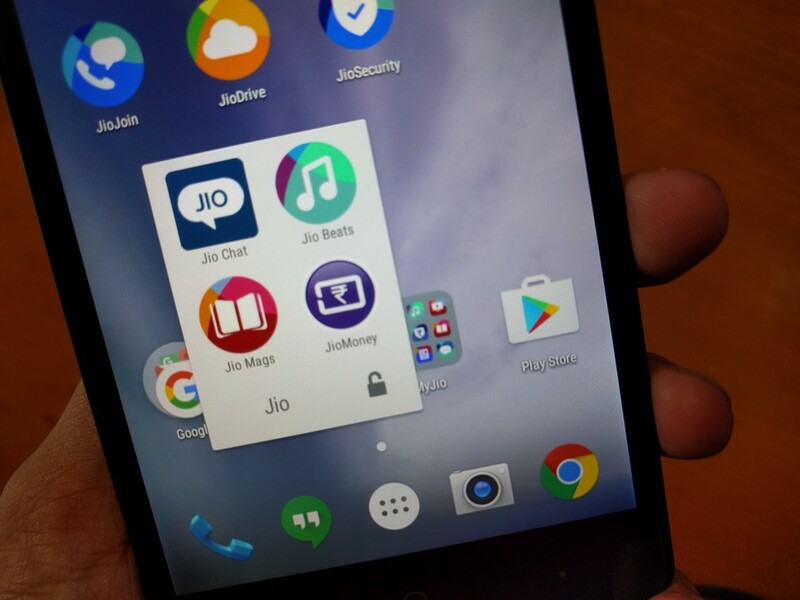 Jio Beats: With the previous two apps, the developers at JIO have covered television, movies, movie trailers and numerous other types of video content. With Jio Beats, your hunger for music will be fulfilled. JioBeats is providing millions of music tracks not only from different genres but also varying in different moods, artists, and languages. Another fascinating thing about JioBeats is that all the content available in the app is completely High Definition. All the songs, albums, playlists, as well as radio, are available for you in High Definition. Another amazing feature of the app is that you can easily connect devices to your phone simply through the app. You can simply connect your phone to a wearable device or a Bluetooth speaker and enjoy better user experience and better quality music. And just like all the latest apps, JioBeats learns from your usage. The more you listen, JioBeats learns more about your taste and provides you recommendations accordingly. Apart from these, you can also download the music, create playlists, listen to radio, listen to regional content (more than 20 Indian languages and international music), and apply different themes. 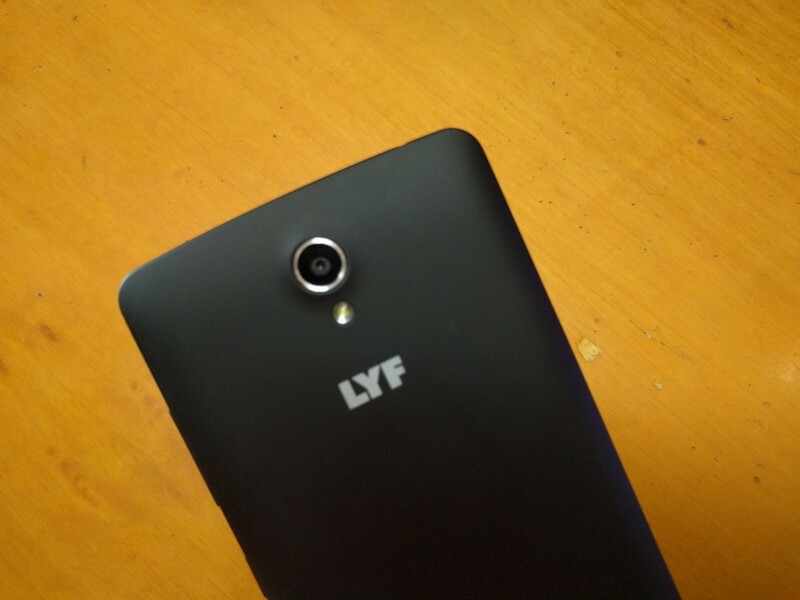 Overall, we see that Reliance has made an enormous impact on the market with LYF Smartphone+ and Jio. Do let us know what you think about Jio and LYF in the comments below.